Guy Weitz is one of those names which seems to have faded into the mists of time. A Belgian by birth, he spent most of his life in London and was organist at the Jesuit Church in Farm Street, a post he held for fifty years from 1917. He could claim a notable pedigree, having studied with Guilmant and d’Indy at the Schola Cantorum in Paris supplemented with extra tuition from Widor. He undertook some early work as organist in Verviers and Liège, but the outbreak of war in 1914 was to change his life. When the Germans invaded Belgium he fled to England, where he remained for the rest of his life. He was an irascible character by all accounts, who shunned close friendships with colleagues, and took on very few private students. Of those he had, Nicholas Danby (1935 – 1997) was the most well-known, and succeeded him at Farm Street in 1967. Weitz made several broadcasts for the BBC World Service, and made a handful of 78s for HMV. There’s an excellent CD of his complete recordings (1926-1931) on the Amphion label, in their ‘British Organists’ series (PHICD 132). This is the first recording of the complete organ works of Guy Weitz. Two organs have been used; CD 1 features the 1891 Schyven organ of Antwerp Cathedral, the largest organ Paul Schyven’s firm ever built. Significantly this is the last recording made on the organ prior to its restoration. Of further significance is the fact that Peter Van de Velde is organist at the cathedral, so no doubt he feels very much at home on this wonderful instrument. Technical considerations, specifically pertaining to the two symphonies, necessitated CD 2 being recorded on the 1935 Bernard Pels & Son organ of Antwerp’s Laurentiuskerk. The composer’s early scores reveal the influence of the French Symphonic School. Considering how much of his life was spent in London, there’s hardly any English influence detectable. An exception is the Fanfare and Gothic March of 1937, composed to celebrate the coronation of King George V1. Amongst the subjects Weitz studied in Paris was Gregorian Chant, an interest he shared with Charles Tournemire. Evidence of his love of plainchant is found throughout his music. In the Grand-Choeur we hear Benedicamus Domino, and the dolefully etched In Paradisum displays that particular chant. Marian motives form a prominent feature of the Symphony for Organ of 1930. Weitz makes full use of the Gregorian Ave Maria. The Stabat Mater features in the ‘Mater dolorosa’ second movement, whilst Ave Maris Stella is sounded out dramatically in the third movement, marked ‘Stella Maris’. The Symphony No. 2 of 1949 is cast on a much larger scale than its predecessor, and its five-movement structure presents the performer with greater technical challenges. 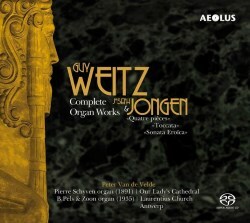 To fill 2 CDs, Aeolus have fleshed the set out with organ music by Weitz’s Belgian contemporary Joseph Jongen. Like Weitz, Jongen moved to England at the outbreak of World War 1, but returned later to his native country where he took up a post at the Royal Conservatory of Brussels. The Toccata is a dazzling tour-de-force, played here with breathtaking virtuosity. The Sonata Eroica ends CD2 in impressive style. It is Jongen’s best-known organ work, intensely rhapsodic and grandiose and showcases to perfection the sonic splendour of the instrument. The sound quality of both CDs is superb. The acoustics of both venues are sympathetic to this music and accommodate wide dynamic range as well as revealing spatial effects and musical detail. The performances are further enhanced by Van de Velde’s interesting and imaginative variety of registrations. The booklet notes give a history of the organs and include the specifications of each. A bonus comes in the form of some beautifully reproduced colour photographs of the instruments and their venues. This excellent release constitutes a valuable addition to the organ discography.